Bear Towel Ring: An adorable polyresin black bear cub with metal ring keeps your towel close at hand on the Playful Cub Towel Ring. Bear Towel Set: A serene brown bear on a patch of greenery and pine trees is embroidered on the 100% cotton ivory Denali Bear Bath Towel with brown trim. Bear Vanity Lighting: With North Woods flavor, the four-light metal art Moose & Bear Vanity Light Fixture, in your choice of rust or black finish, silhouettes the black bear and northern moose. Cozy Bathrobes: The ultimate in luxurious comfort, this superior-quality faux fur robe is as indulgent as it is beautiful. Faux Fur Slippers: Pamper your feet and keep them snug, even on the coldest days, with these irresistibly soft slippers trimmed with plush faux fur. Luxury Bath Towels: These signature PB Classic Bath Towels are the softest and plushest you’ll find. They’re made of Turkish cotton terry, prized for its absorbency and texture. These embroidered terry towels feature faux suede trim for comfy rustic style. Machine wash.
Rustic Americano Vanity Lighting: Featuring a variety of Kalco's exclusive finishes and shades, these simple, rustic metals combine with pioneer details like lantern rings to create charmingly rustic pieces. Rustic Bear Vanity Light: Add rustic style to your bathroom with the Rustic Bear Vanity Light Fixture. Available in rust or black finish. Rustic Bookcase or Storage Unit: The Morris collection reclaims pinewood pallets, expertly refinishing them to create this rustic yet refined bookcase. Rustic Ladder Floor Storage: Create a stylish space in the bath that provides easy access to essentials with this simple and creative design. Rustic Medicine Cabinet: The rustic warmth of 19th-century furniture was the muse behind the Benchwright Medicine Cabinet. Rustic One Light Vanity: Dover 1 Light Bath Vanity Light from the Dover Collection is finished in a gorgeous antique copper. Rustic Single Vanity Light: The Timberland Rustic Single Vanity Light is perfectly suited to your home or lodge. Crafted from metal with a nature-inspired flair, this vanity light features moose and pine tree silhouettes to create defining style. Rustic Vanity Light: Each of these Rustic Glass Sconces is entirely hand blown, lending unique markings. Rustic Vanity Light Fixtures: Add grace and warmth to your room with the Canyon 3 Light Vanity. This lodge vanity light is made from metal and features deer and pine tree silhouettes. Vince Two Vanity Rustic Light by Kalco: Rustic Vine on lattice collection with bark finish. 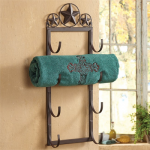 Western Towel Rack: Circled western stars and a dark brown finish make this metal towel rack a great bathroom storage solution. Measures 8¼"W x 3¼"D x 26"H.